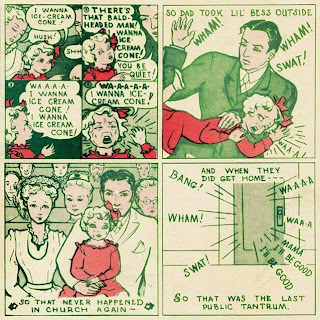 A tract on spanking children at church, circa 1945-1948, from "The Kids Tract Club," in Winona Lake Ind., distributed by Talking Gospel Pictures in Spokane, Wash. The tracts were sold at $1.50 per 100. This was one of a series of five, called "The Tantrums of Lil' Bess," by a woman named Betty Russell. In one tract, a 2-year-old Bess is shown being disciplined with the statement, "God is up in heaven. He sees everything we do." In another, 3-year-old Bess learns that she does bad things because she's sinful. 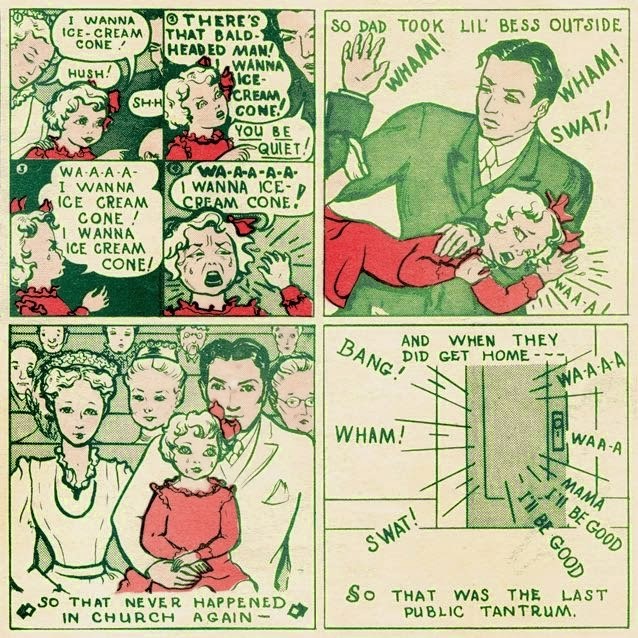 More of the Lil' Bess comics can be seen on Ethan Persoff's site. Will the "nones" become a voting bloc? Daniel Silliman teaches American religion and culture at the University of Heidelberg. His research interests include American evangelicals and pentecostals, book history, atheism and secularity. Silliman has a B.A. in philosophy from Hillsdale College and an M.A. in American Studies from the University of Tübingen. He is currently working on his doctoral dissertation at Heidelberg on the representations of belief in contemporary evangelical fiction. He previously worked as a reporter for a metro Atlanta newspaper, where he wrote about crime. He has lived in Germany with his wife since 2008. Jackson Cuidon read the Left Behind books as a kid. Sam Hose was burned to death in Georgia on a Sunday. In 1907 in San Antonio, in the heat of July and Pentecostal revival, Charles Fox Parham was arrested. Francis Schaeffer's 1982 message to the Presbyterians at Coral Ridge Presbyterian Church in Fort Lauderdale, Fla., was pretty simple: the philosophy of modern society is humanism, and humanism means death.